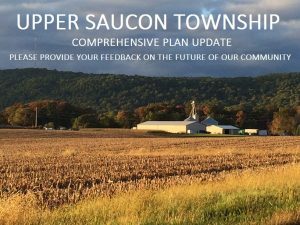 Upper Saucon Township is updating its comprehensive plan and vision for the future of our community. The planning process includes study, discussion, and community input to determine the appropriate locations in the Township for development, preservation, and conservation of land. The questions in the attached survey cover various land use planning topics and will help to assure the community is inclusive when meeting today and tomorrow’s needs for development of housing for all ages as well as commercial, institutional, recreation, and industrial space and associated utility and transportation infrastructure. Please complete the survey questions to help the Township understand what issues are most important to you.